Carolyn Lim began teaching fitness classes in 1989 in Vancouver, Canada. In 1998, she moved to Manila, Philippines where she established Balanced Body Studio a year later. In the Philippines, Balanced Body Studio is the pioneer in teaching Pilates, Gyrokinesis® and Gyrotonic®. Coming from a strong and varied background in the field of fitness, Carolyn boasts an extensive repertoire of credentials. She has been a certified fitness instructor and strength trainer with the BCRPA (British Columbia Recreation and Parks Association) since 1989, as well as a CAN-FIT-PRO (Canadian Fitness Professional) certified fitness instructor specialist since 1994. Carolyn has achieved Polestar certifications in Mat, Allegro and Studio, as well as Gyrotonic® Level 1, Gyrokinesis®, Ladder and Gyrotoner® certifications. She is a member of the PMA (Pilates Method Alliance) and serves as a Polestar Education Mentor for Mat and Allegro. Stephanie Lim is an avid sportswoman, having been a competitive athlete since the age of 8 for school varsity teams in cross-country running, volleyball, basketball, track and field, softball, and rowing. She is also a former Philippine National Karate Team athlete both for Women’s Individual and Team Kata (Forms), and Junior Philippine Team Kumite (Sparring) athlete. Highlights of her competitive karate career include medals in prominent tournaments such as the 23rd Southeast Asian Games, KOI World Championships, and Asian Karatedo Federation Championships. As a person who loves sports and an active lifestyle, she continues to be part of the Association for the Advancement of Karatedo as an instructor, is a certified Polestar Pilates Mat instructor, and is also certified in Basic First Aid and CPR-A from the Lifesaving Society (Canada). She is currently working on attaining her Polestar Pilates Allegro Instructor certification and San Diego State University Certificate in Personal Training. Debbie Chua began taking Pilates, to relieve her lower back pain, while she was still an Interior Design student. Her teaching is influenced by her love for activities such as photography, dancing, capoeira, surfing, and wakeboarding. Debbie, who has participated in Pilates, Allegro, and Gyrokinesis classes since 2001, received her Polestar Pilates certification in 2007. Her goal is to make fitness enjoyable and rewarding for her clients by encouraging them to reach their optimum fitness potential. Tania Son-Vaca was hooked on Pilates in 2001 and has been an avid practitioner of Pilates Mat, Allegro and Gyrokinesis® since then. As a young child, she was drawn to physical activities and the outdoors, which made equestrian show jumping her all-time favorite sport. In 2007, Tania became a Polestar Pilates certified instructor in Mat and is currently working on attaining her certification in Allegro. Other than her love for teaching, Tania continues to lead an active lifestyle with her husband and one year old baby girl. 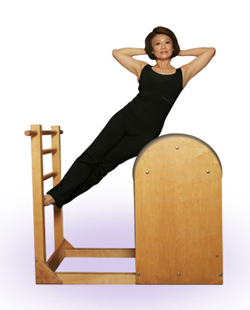 Shawn Yao found Pilates as a last resort to alleviating back pain back in 2003. She has been hooked since then and swears by it so much, she would love to share the benefits with others. Shawn is currently working towards her first certification in Allegro. Candy Lim began taking Pilates 9 years ago. Since, she has worked in four different industries, but the one constant is her weekly Pilates class. She loves the strength and tone it gives to her muscles, and appreciates the way it helps protect her body from injuries that can occur from her physically-oriented corporate job. In 2008, Candy began working on her certification for Allegro. A trainer by vocation, she is excited to share this passion with others.